The eyes of the Jewish State remain fixed on Europe following the European Union’s decision to label products made within the disputed territories of Israel last month. The presence of BDS unfortunately continues to grow on college campuses and in academic networks across the United States, but the anti-BDS movement also grew stronger in recent weeks. We are hard at work doing everything we can to educate the public on the true implications of BDS and to end the anti-Israel movement that political analysts overwhelmingly warn threatens peace and stability between Israelis and Palestinians. German Chancellor Angela Merkel announced that she supports the labeling of Israeli settlement products in early December, a move seen as a serious setback for the Israeli government who counted on Germany’s support in convincing other EU member states to reject implementation of labeling. Merkel has repeatedly denounced BDS over the years, but refused to give insight into her decision on supporting labeling. She did, however, stress in her remarks that the labeling will absolutely not lead to boycotting and that Israel will still continue to receive preferential market access. Merkel’s move directly conflicts with the sentiment expressed by Germany’s parliament, the Bundestag, which rejected EU labeling -- condemning it as “unnecessary and unwise” -- shortly before Merkel made her announcement in its favor. Greece also came out against EU labeling this month, joining Hungary as the only European state to publicly denounce it. On the homefront, there was a mixed bag of BDS-related news. The National Women’s Studies Association -- one of the biggest academic networks in the United States -- came out overwhelmingly in favor of BDS early this month. However, in response to the recent surge of BDS support from academic networks, two American law professors argued in a Wall Street Journal column that the legality of educational associations adopting BDS is highly questionable. Some more good news: the Obama Administration explicitly came out against BDS during the US-Israel Business Initiative in Washington DC. There is also a new academic network intent on combating the BDS movement on college campuses and in academic networks in the United States. And in the UK, the University of Lancaster officially rejected BDS in a tight vote. Meanwhile, in Israel, a new anti-BDS campaign began under the supervision of Yesh Atid leader Yair Lapid, who argues that BDS is an anti-Semitic movement sponsored by global jihadi organizations. Lapin intends to take his education campaign to colleges across the world and to educate students on the reality of BDS and the State of Israel. Another American Jewish celebrity used their star power to combat the growing presence of the BDS movement in Hollywood last week: Adam Sandler condemned Roger Waters for supporting BDS and went on to address the movement at large during an appearance on the Howard Stern Show, emphasizing his unwavering support for Israel and Judaism. And in a showing of solidarity with the Jewish State, the legendary Elton John announced that he will return to Israel for the fourth time in May to play a show in Tel Aviv. On this day 97 years ago, the first meeting of the American Jewish Congress convened in Philadelphia's historic Independence Hall. Jewish leaders and Zionists came together to lay the groundwork for a populist counterbalance to the American Jewish Committee, which, at the time, was dominated by the wealthy and conservative German-Jewish establishment. Great American Jewish thinkers Stephen S. Wise, Felix Frankfurter, and U.S. Supreme Court Justice Louis Brandeis gathered to lay the groundwork for a national democratic organization of Jewish leaders, and to discuss Jewish concerns post-World War I; those same men would go on to present a unified American Jewish position at the Paris Peace Conference in 1919, and would continue to defend the rights of American Jews and all Americans for the rest of their lives. We are still active, meeting with world leaders and representing a sensible American Jewish agenda. Last week, I attended the swearing in ceremony of Argentina's new president, Mauricio Macri, who I have had the great pleasure of getting to know over the past few years. Macri attended our annual International Mayors Conference in Israel last year, where he met with Prime Minster Netanyahu and numerous other Israeli political and cultural leaders. I look forward to supporting President Macri as he works to revitalize Argentina's image at home, within Latin America, and around the globe. For the Jewish community especially, President Macri will be an important partner in confronting sponsors of terror and ultimately, creating a safer, more tolerant world. And today, on the anniversary of our founding nearly 100 years ago, I met with the Brazilian ambassador to the United Nations, Antonio Patriota, to discuss Jewish interests in South America and Brazilian relations with the United States and Israel. Thank you for your continued support over the years. Even as our organization changed -- grew or shrank, altered its platform or its function -- you stayed with us, through thick and thin. So on the anniversary of our founding, we simply wish to express our gratitude. As we approach the end of 2015, I wanted to update you on the innovative efforts underway at the American Jewish Congress. We close out our 97th year as an influential organization by building on the successes of our past and adapting our approach to meet the new challenges confronting the Jewish community at home and abroad. We are the Jewish voice of tomorrow. October brought the American Jewish Congress to Israel for its 30th annual International Conference of Mayors, drawing leaders from the US and across the globe, including New York City Mayor Bill de Blasio. The theme of this year’s conference was “Smart Cities.” The group learned firsthand about the technological marvels being pioneered in Israel, and made visits to cutting-edge tech facilities. Our aim is to identify future leaders at the local level and to impact their views of Israel. Two alum of our conference were elected head of state in the past two years: Mauricio Macri, the new president of Argentina, and Italian Prime Minister Matteo Renzi. At the United Nations General Assembly in September, I met with world leaders to discuss and personally counter the corrosive spread of the anti-Israel BDS Movement. It is one of our top priorities to oppose BDS and to inform influential political leaders in the United States and beyond, as well as the general public, of the true political nature of BDS: to ostracize, delegitimize, and isolate Israel. Our efforts culminated in the U.S. House and Senate passing measures in opposition to BDS. We also expended great effort lobbying against the flawed Iran nuclear agreement by meeting with members of Congress and the Obama Administration, and beseeching them to rework the deal. Despite its passage, AJCongress continues to work to ensure U.S. and Israeli security interests are enhanced through rigorous enforcement and close monitoring of the deal should Iran violate it. We also remain dedicated to bringing to light Iran’s dangerous actions in the region. On another front, over a thousand AJCongress supporters responded to our urgent call to support House Resolution 293, condemning Palestinian violence against Israelis and calling on the Palestinian Authority to stop inciting violence and end the conflict. The resolution unanimously passed both the House and the Senate, thanks in part to those who emailed their representatives. Over the course of the year, our newly initiated Speakers Series hosted presentations with U.S. Senators, as well as former Israeli National Security Advisor, Major General Yaakov Amidror, providing the AJCongress audience insights on the most pressing issues facing Israel and the American-Jewish community. We made significant strides this past year on our broad agenda. But our work is not done. Your support is indispensable if we are to continue our mission to make progress to bring peace, security, prosperity, and understanding to Israel and on behalf of Jews everywhere. Please consider contributing to our organization today by donating online or sending a contribution by mail to our headquarters at: 260 Madison Ave. 2nd Fl, New York, NY 10016. On behalf of everyone at the American Jewish Congress, I would like to wish you and your family a Happy Hanukkah. May the story of the Festival of Lights bring you hope and inspiration, both during these eight days and throughout the year. The American Jewish Congress is hard at work pressing for improved US-Israel relations, monitoring Iran to make sure that it does not breach the tenets of the nuclear deal, and advocating against the anti-Israel Boycott, Divestment, and Sanctions (BDS) movement -- which, unfortunately, took another sharp turn this month on the heels of anti-Semitic sentiment felt from Europe to the University of California Santa Cruz. The European Union (EU) Commission approved new guidelines for labeling Israeli products made in east Jerusalem, the Golan Heights, and the West Bank -- regions that are excluded from the Israel Free Trade Agreement with the EU -- but argues that these guidelines are merely a technical matter and not a showing of support for the BDS movement. Hungary has decided not to adopt the EU’s new special labeling policy, and described it as “irrational,” citing concerns that it will not aid in the Israeli-Palestinian peace process. Two American-Jewish professors argued that the BDS movement is in the greatest long term interest of Israel in a contentious Washington Post column, to which AJCongress President Jack Rosen responded in a Times of Israel op-ed. London Mayor Boris Johnson openly denounced the BDS movement while on a trip to Israel earlier this month. Israel has a new ministry designed to fight back against the economic repercussions of the BDS movement, with an emphasis on the EU. More campus controversy over BDS after a Jewish member of the UC Santa Cruz student government was pressured into abstaining from a vote on the college’s divestment policy. This week marks 40 years since the United Nations General Assembly (UNGA) passed the infamous “Zionism is Racism” resolution, with impeccably ill-timing, on the anniversary of Kristallnacht -- November, 10, 1975. 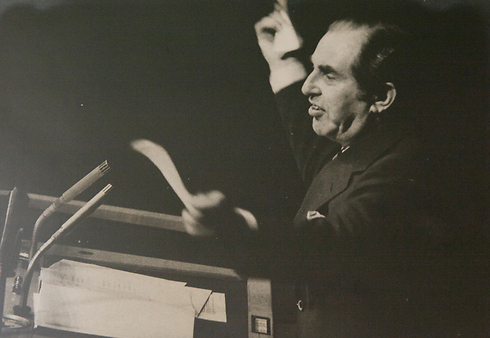 This resolution, being one of the very few to later be repealed by the UNGA (in 1991), was condemned by the great Chaim Herzog, who delivered one of the most empathic speeches by any Israeli leader after the resolution passed. “For us, the Jewish people, this is no more than a piece of paper and we shall treat it as such,” Herzog so eloquently stated before physically tearing up the resolution on the UNGA podium. Resolution 3379 was originally supposed to condemn racism and neocolonialism when it was drafted, but a group of UNGA member states slyly included a provision that categorized Zionism as a form of racism and neocolonialism. Historically anti-Israel nations, such as the Soviet bloc states and Arab countries hailing from the Middle East, coalesced around the new version of the resolution in an effort to undermine Israel. While UNGA resolutions hold no binding legal ramifications, and are more symbolic than anything, some would argue that General Assembly Resolution 3379 paved the path for modern antisemitism, and at the very least, created a token around which anti-Israel nations could gather. Herzog, who sought peace and reconciliation with the Palestinians for the duration of his career as an Israeli ambassador and later as a beloved president, argued that this resolution willfully questioned the Israelis’ right for self-determination, and refused to go down without a fight. So he stood in front of the UNGA and delivered the most famous address of his life, but to no avail. Unfortunately, much of the world -- including the 72 member states who voted in favor of the resolution -- failed to see the implicit hypocrisy in denouncing the single free Middle Eastern nation as a neo-colonialist and racist state, especially as the bulk of support for the resolution came from historically oppressed and colonized states (such as those from the USSR). Ultimately, the UNGA realized the mistake they made and the damage caused by this resolution -- which some would argue derailed peace talks between Israelis and Palestinians at a crucial time, shortly after Yasser Arafat’s olive branch speech to the UN -- and revoked Resolution 3379 in 1991. It was just the second UNGA resolution to be repealed at that time. While Herzog went on to become one of the most esteemed presidents in Israeli history, the precedent set by Resolution 3379 unfortunately still lingers at the UN, where the UNGA continues to draft anti-Israel resolutions and the UN Security Council exhibits clear bias against Israel, to this very day. The UN, which originally rose from the ashes of World War II and the Holocaust to promote peace and prosperity, has evidently lost sight of one of its quintessential founding goals: to make sure nothing like the horrid nightmare that befell the Jews ever happens again on this Earth. With Israel still cast under a harsh condemnatory light -- exhibited by growing support for the BDS movement and constant scrutiny over its presence in the West Bank and Gaza -- it is unfortunate that we cannot tout much progress since the days that Zionism was equated with racism and neocolonialism. The one thing we can do on this day is pay respect to the late, great Chaim Herzog, one of the most adored political leaders that Israel may claim as its son. Thank you for all you did for Israel, Chaim, and may your message of peace and tolerance serve as an everlasting memento to your historic career. Rest in peace. Today marks the 77th anniversary of Kristallnacht, or the "Night of Broken Glass.” On November 9, 1938, Nazi soldiers terrorized the Jewish populations of Germany and Austria, creating a culture of fear, paranoia, and hatred before the eventual horrific genocide of over six million Jews. That evening, the Nazis took the lives of 91 people -- burned down synagogues, looted Jewish-owned stores, and destroyed homes -- but they also shattered the lives of hundreds of thousands. American Jewish Congress (AJ Congress) co-founder, Rabbi Stephen S. Wise warned the world about the impending dangers of Naziism in the early 1930’s; and the AJ Congress took the lead in lobbying the American government to accept Jewish immigrants from war-torn Europe throughout World War II. But to no avail. No one could have predicted what would come to follow Kristallnacht at the time of that reprehensible evening. The Nazi’s hateful rhetoric and treatment of Jews is now, unfortunately, seared into the memories of everyone in the world as we know it, and has undoubtedly altered the course of history in numerous ways. While we take tonight to mourn those lost on this evening 77 years ago, as well as every other person who lost their life to Hitler’s monstrous regime, we must also pay respect to those who have lost their lives to anti-Semitism in the years since. Yesterday we mourned for Prime Minister Yitzhak Rabin on the 20th anniversary of his death, one of the darkest days in Israel’s history. A true visionary, it was through empathy and sheer determination that Rabin negotiated the tenets of the Oslo Accords and the Israel-Jordan peace treaty, claiming the Nobel Peace Prize in the process. He also served as a lieutenant general and chief of the Israel Defense Forces at the birth of his nation. He was a true son of Israel.